Generations of gamers who have not only the arcade but also years of computer, Nintendo, and PlayStation games in their pasts are now, themselves, raising children. In a world of wall-to-wall screens and endless gaming options, it can be hard to find just the right game for game-loving parents and their inquisitive kids to enjoy together. Over at Brainy Gamer, Michael Abbott describes the challenge of finding games that engage his four-year-old daughter, Zoe. Games designed for kids don't always do it. But Skyrim does. "Kids quickly learn that parents save the best stuff for themselves," Abbott wisely observes. "Zoe is happy to while away twenty minutes with a Dora game, but she knows whatever I'm playing is likely to be a hundred times more interesting, and she wants a piece of that action." Enter Skyrim. While clearly some parts of the game are too violent or explicit to be kid-friendly, Abbott finds that with some planning and prep work on his part, Skyrim is perfect for his daughter to enjoy. 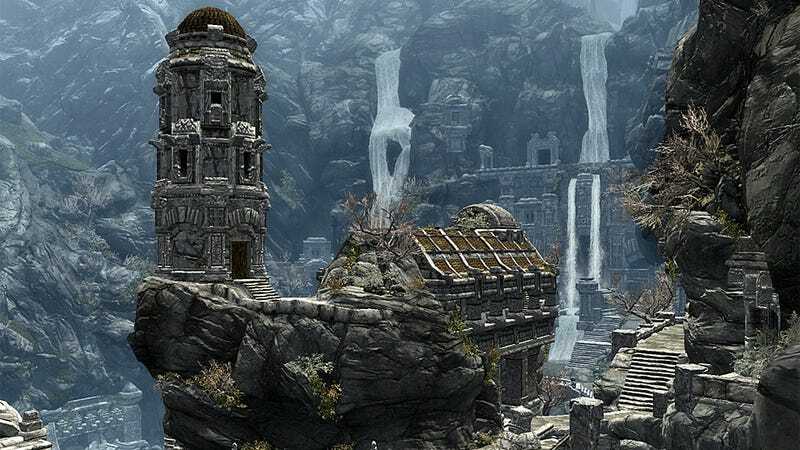 There are eight ways parents can help make Skyrim great family fun time, Abbott explains. Some are more obvious than others. For example, no matter what system the game is running on, a game pad will be easier for small, young, relatively uncoordinated hands to learn to use than the keyboard-and-mouse combination is. Likewise, establishing an ethical code of action in advance—such as "help people who ask for it"—can make the wide and murky waters of a game easier to navigate. "Be a mage," Abbott also advises. "I prefer Zoe casting spells to wielding swords and axes. It feels less ‘realistic' to me and more suitable for a child." And of course, parents should review the game, or sections of the game, before sharing them with a child, to make sure the content in question stays appropriate. Let your child discover there can be more than one way to solve a problem. I spared Zoe the Fellglow Keep gore, but let her face The Caller boss at the end of the quest for a reason. We were given the choice of fighting her or negotiating with her, but we found a third option we liked better. We cast an Invisibility spell, grabbed the stolen books, picked her pocket for the exit key, and escaped the dungeon. "We were smarter than her, Daddy!" You bet we were. Thanks to the time she's spent in Skyrim (and with her brainy gaming dad), four-year-old Zoe can now read maps and count currency. And she's young enough not to care about things that may not matter: " Just remember that a small child thinks less about leveling up or RPG mechanics," Abbott cautions, "and more about having fun, moment to moment, in an imaginary world." Sounds good to me. Maybe we really should try seeing games through the eyes of a child more often.